My name is Mark, and I want to thank my wife Michelle for helping me turn a bad time in my life into a positive. Like many new parents, Michelle and I couldn’t wait for the birth of our baby. But after a long labour, Michelle had an emergency C-section. I had a panic attack, convinced both my wife and baby were going to die. Michelle suffered badly from postnatal depression, and I gave up work to care for my family full-time. But rather than making life better, things got worse. I just wanted Michelle to get better, but since I didn’t talk to my friends, I started feeling isolated and guilty – and I turned to drink to block things out. After six years of suffering in silence, I had a breakdown. I’ve founded a non-profit group ‘Fathers Reaching Out’, letting people know perinatal mental health issues can affect fathers too, and now I focus on raising awareness and aim to change policies to support the whole family. From a bad time in my life, with Michelle’s help I’ve turned it into a positive. One piece of advice we learnt together: “The quicker the help, the quicker the recovery”. 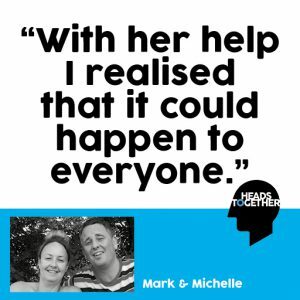 If you are struggling our charity partners run support services that may be able to help. CALM offer a helpline for men, so if like Mark so you are struggling they are there for you. Find out more. For more stories of support see our celebrate support page.